WAIALAE COUNTRY CLUB . This country club is world famous for the "Hawaiian Open" golf tournament. The club is adorned with a wonderful collection of art and sculpture from artists living in Hawaii chosen and commissioned by Mr. Adams. 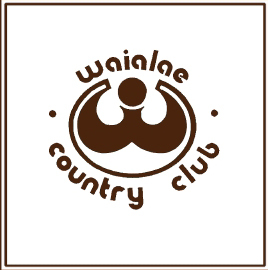 Of particular note is the new logo designed for the club which replaced a conglomerate symbol which combined an English crown, crossed golf clubs, waves, and a "mud hen" which is the translation of "Waialae." The new logo synthesizes these elements into a single emblem based on the feather cape worn by "Alii" - the kings. This cape is topped by a golf ball symbol. The pattern on the cape also can be seen as the letter "W" for Waialae. 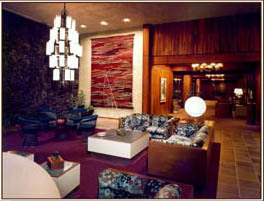 Thus one emblem bespeaks Hawaiian heritage, royalty, golf, and the instantly recognized "W." SHERATON WALKER HILL, KOREA. This restaurant reflects the vocabulary of contemporary Italian design from Milan. 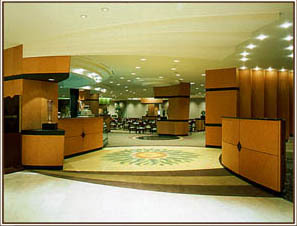 The beautifully paneled walls and display "columns" are subtly tapered in an outward flair. The ceiling is sculptured in cuts and layers, emphasized by the dramatic lighting effects. The entry is accented by a mosaic tile floor, precut in Italy. The display columns provide a dramatic focal point for glass art while disguising the concrete structural columns hidden within.